English Walnut, Kream Nut, Caramel Fig & Nut Tropical Fruit. Ask for these 5c candy bars. 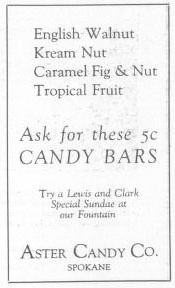 Try a Lewis and Clark Special Sundae at our Fountain. 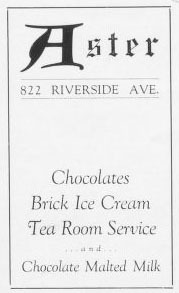 Chocolates, Brick Ice Cream, Tea Room Service and Chocolate Malted Milk. Appreciated gifts. A graduation gift may be one of a thousand things but you are more sure to please her with a nice box or basket of candy than most anything else you are able to give her. 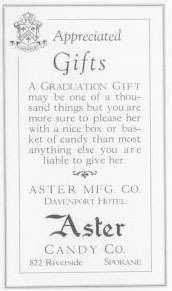 Aster Mfg. Co, Davenport Hotel.